Cleaning aluminum wheels can be an intricate task, and you want to protect your investment, so share your tips for cleaning them here and read others already submitted. 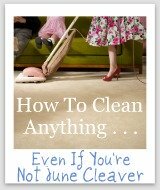 You can be the first to share a tip with me about this cleaning task. 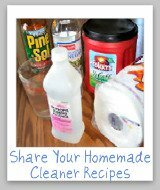 When you do share your tips, make sure to tell me both what cleaning products and equipment you used to get the job done. All types of items in your home are made of aluminum, but not many are such an investment as your aluminum wheels for your car. The more expensive the car it seems also the more expensive the wheels. 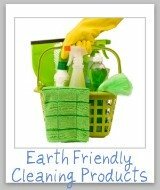 And not only can they be expensive, but they are often quite intricate to clean too. 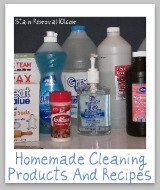 Therefore, I would love to hear your cleaning tips for how to clean these wheels, including what cleaning solutions you use, and equipment. Make sure you share your best tips with me, because the really great ones will be featured on the site. 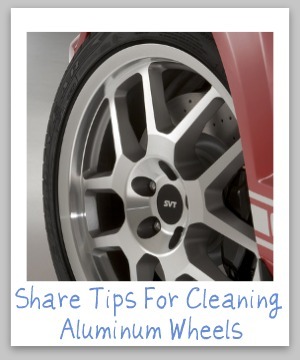 Aluminum wheels are a common object that needs cleaning for our cars, so share your tips with me for how you do it.